The proposal is for the client to develop the garden of her property to provide a suitable property that she can downsize to, that will meet her needs when she retires and as she grows older. And to provide homes for her son and daughter and their families which they may purchase with the assistance of the Government Help To Buy Scheme. In many ways this is an innovative social proposal, in that it provides housing for an extended household over three dwellings. Although the houses are distinct and could be resold as separate entities, the whole is seen as a familial commune and envisaged to offer various ways of dwelling for visitors and family members to care for each other and stay-put. 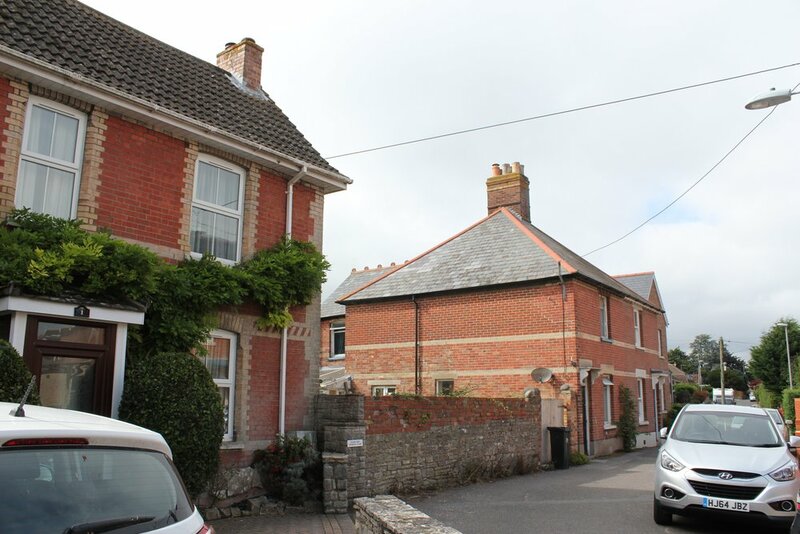 The client intends to extend her existing property – 3 St Michael’s Road – and to develop the large garden to create 2 additional houses which will comprise a three bedroom house, a two bedroom duplex and a one bedroom ground floor flat. It is intended that my client will occupy the one bed flat and her son and daughter will occupy the two three bed houses with their families. This will provide the opportunity for the families to live close together so that my client can assist with the care of her grandchildren and her children can assist with my client’s care should she require this in the future. It is intended that the two bed duplex will be retained for the use of my clients’ other two children when they visit with their families. The frontage of the proposed terrace will be an exact copy on the front elevation of what already exists at 3 St Michael’s Road. The windows, doors and proportions and location of these elements shall all match. Importantly, the roof shall be simply an extension of what exists. Also by proposing two extra houses there is symmetry at the front with all four houses matching. 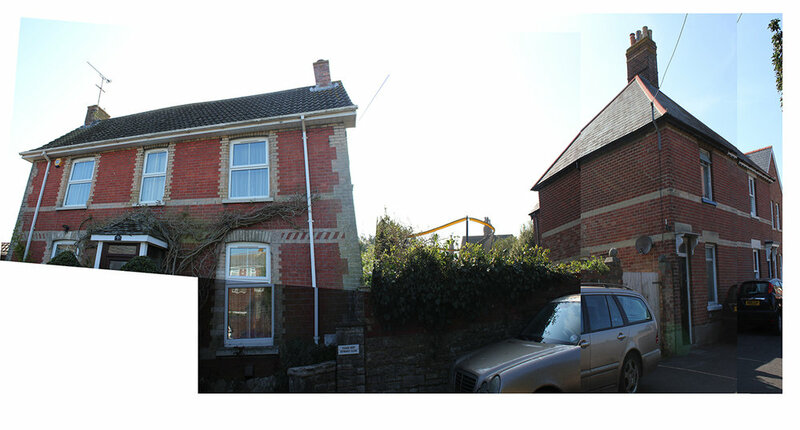 The rear elevation has proposed extensions that are a match of the proposed extension to the existing house and for which planning permission has already been granted. Balconies are proposed on these extensions with 1.8m planted screens to create privacy and eliminate overlooking. These extensions shall have openings at the rear with folding glass doors onto the garden and each will have a strip of glass skylight. The new three bed house shall have a large kitchen, living and dining space at the rear with a front sitting room, two bedrooms and bathrooms on the first floor and a master bedroom with shower and storage in the loft. The conversion of the existing house will match this layout. The single bedroom flat shall have a similar layout on the ground floor to the new three bed house and existing house with the front room forming a bedroom. The duplex will have a kitchen, living and dining space on the first floor with bathroom and a second bedroom with shower in the loft. The rear elevation shall have outriggers that match the outrigger on the existing house but will be slightly wider so as to allow for a decent living, dining and kitchen space on the first floor of the two bedroom duplex. At the side of the duplex, in the loft, there will be a dormer window to allow for adequate head height in the second bedroom. This will be obscured from the street as it is along the alley to the side of the house. All windows on the rear will match the existing property. The single bedroom flat on the end of the development is accessed down a private side alley, which will also accommodate bin and bike storage spaces. The front door is centred on the side elevation and leads to a hallway, which accesses the living, dining and kitchen space and a bathroom. The single bedroom is located at the front. The duplex on the end of the terrace is accessed via stairs located off the front door on the end of the frontage. These stairs lead up to a landing with adjacent window, which in turn leads off to a winding staircase providing access to the second bedroom and shower room in the loft. Off the landing there is access to the rear for the living, kitchen and dining space that leads onto the balcony. The three-bedroom house in the middle of the terrace, next door to the existing house, is similarly accessed via the front door, which leads past a sitting room towards the living, dining and kitchen space in the rear. Next door to the front sitting room is the staircase that progresses to the two bedrooms and bathrooms on the first floor. The master bedroom on this floor has an en-suite bathroom. Stairs from the first floor lead up to a third bedroom in the loft that will have dormer windows for required head-heights, a shower room and nearby loft storage which will be lit with conservation skylights. This layout will be exactly matched in the conversion of the existing property. With matching red brickwork, decorative yellow banding, porches, sash timber windows at the front; matching outriggers at the rear, with matching windows and matching windows and door at the side – the proposal is, in as many ways as possible, a copy of what already exists. The slates will be matching throughout the development. The skylights shall be conservation grade. The roof will be decked on the balcony areas and treated with GRP elsewhere. The brickwork shall be redbrick to match as closely as possible the aging and colour range of the existing house. 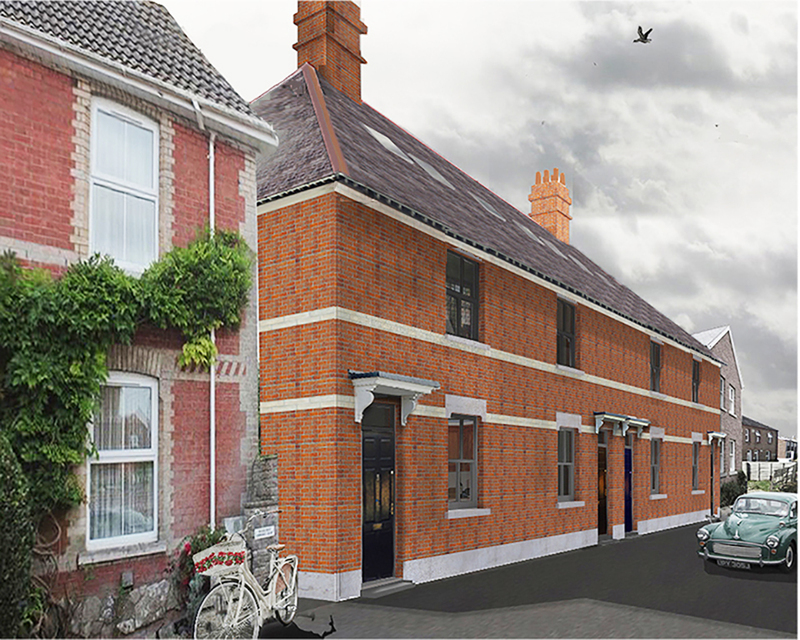 My Client currently finds the present large garden difficult to maintain and the proposal for a terrace is a way to develop the site that is in keeping, not only the existing semi-detached house, but the streetscape of central Wareham with its many terraced blocks. By creating a terrace, the sense of community is maintained as it enables the family to stay close and in the same place they have enjoyed living. As a growing family, it is important that they maximise the use of this site so they can live there. The side alley creates a distinct gap between the neighbours so the will be no sense of over crowding. DCC Highways have indicated there is no need for parking and the terrace, therefore, is a natural way to develop this site modestly and in a coherent fashion. In conclusion, this proposal offers the client and her family the opportunity to improve and to add to the character of the area in a simple and clear fashion by extending and copying what exists already and is of good design and build. Significantly the proposal also reveals a new way that an extended family and household can be accommodated to facilitate many interactions offering various care and social benefits.